This KOA has the most 'private' sites I've seen yet. There are lines of trees and bushes between each campsite - very nice. And even though it's in the middle of the Mohave Desert, there are actually a lot of trees around the perimeter as well. Each campsite also has a small outdoor grill. 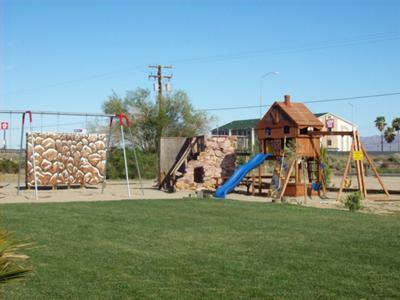 The campground does not have grass (except at the playground), but there is newly spread gravel (April 2010) which definitely helps with the dust blowing. Although the showers aren't very big, they are clean. You have to get tokens from the office to use the showers however - one token gives you 6 minutes of shower time. The only problem we've had with that is that you use up a minute of that time waiting for the hot water. Large laundry room, good sized machines plus there is one super-size washing machine for blankets, sleeping bags, etc. Very nice playground (with grass) at the front of the park - a train caboose and several climbing structures. Banana bike rentals and an archery range; plus a very nice recreation room with *free* games: pool, air hockey, ping pong & foos ball. Large pool - not heated although I'm sure that's not an issue as the summer rolls on. Free WiFi ? good signal even at back of the park. How amazing!Thanks for the post.We’re so glad to have you as a valuable contributor! Hope you’ll come and see us on our free family travel forums! Join in and write your own page! It's easy to do. How? Simply click here to return to Camp-California.